Today’s Star contains an article beginning a series about the hidden corners of the TTC with a look at the ghost station at Queen and Yonge. This was built back in the 50s with the Yonge Subway, and passengers crossing between the northbound and southbound platforms walk through an underpass on the platform level of that station. Back in 1968, a few years after the original Keele-Woodbine section of the Bloor-Danforth subway had opened, the TTC was thinking about the Queen Street subway. One proposal floated through the Commission for streetcar subway through downtown operation. The full report is interesting reading because clearly, in 1968, the TTC was still thinking of new ways to use its streetcars. The proposal was for a subway from west of Sherbourne to east of Spadina. Schemes for streetcar subways had been around for a while, and I described an earlier one in a post last year. The report throws cold water on this scheme saying that it would not materially improve the capacity of the streetcar line, and it is clear their sympathies lie with a full subway scheme. Things did not change much for decades thereafter. It is worth noting that in the late 1960s, there were more than 60 cars/hour on Queen Street east of Yonge. Today, the service is equivalent to 23 cars/hour allowing for the larger size of the ALRVs. A full subway under Queen initially from Roncesvalles to nearly Leslie, turning north alongside Greenwood Yard , up Donlands to O’Connor [later proposed to go north across the Don Valley to Don Mills and Eglinton]. Streetcars would terminate at Sunnyside in the west, and near Leslie in the east. A full subway under Queen from University to Leslie, then turning north as described in the first option. Streetcars would continue on the surface over the entire Queen route. The same subway as described in (2), but with through “Queen” service running across the city via King Street. In the second phase, the subway would be extended west roughly to Humber Loop. Why anyone would terminate a subway there is beyond me, but that was the plan. An isolated streetcar line would run from Humber west through Long Branch. A route from Greenwood Yard to Queen via the CNR right-of-way. Widening Queen Street by demolition of buildings on the north side. This was long before Queen West became the destination it is today, but it is hard to imagine the city all new development from downtown to Sunnyside along Queen. Building the subway (except through the heart of downtown) behind the existing buildings on Queen much as the Bloor-Danforth line runs behind buildings for much of its length north of Bloor Street and Danforth Avenue. There is reference to a proposed mall or promenade in the downtown area connecting with the Yonge station on the Queen line. This is the beginning of what we now call the PATH system. Old City Hall had not been saved yet, and there was to be a major development (the Eaton Centre) where it stands. This would have provided the jumping off point for the “mall”. The report states clearly that a “ghost station” does not exist at University Avenue, only piers to support the existing Osgoode Station if a new line were to pass under it. Instead of the Queen Subway, we got the North Yonge line and other forays into the suburbs. Several regular correspondents here will disagree with me, but in the long run the city came out on top. We kept Queen Street intact, we still have our streetcars (although at only a shadow of their former service level), and finally we have a chance to expand an LRT network into the suburbs. This entry was posted in Queen Car, Subways, Transit. Bookmark the permalink. The suburbs lost out by not building the Queen line as well. If the Queen subway had gone up to Don Mills and Eglinton (as in your map), it surely would have been extended further north over the years, and relieved the Yonge line and B-Y interchange. Yonge would have eventually been extended north, Queen, or no Queen. I’m not so sure 501 and 504 riders would agree with your position that we’re better off with streetcars on Queen. I’d say the majority of complaints here are on those two car lines. Giambrone is quoted as saying the Eglinton Transit City line will be built with high platforms and trackbeds that can be lowered to accommodate subways in the future. I think that’s a waste of money. If they anticipate that someday Eglinton will need a full subway, they should just build the underground section like that now, with LRT on the outer ends. How will they be able to close the line for years in the future for conversion to subway? Are these people thinking straight? Steve: I think that when people talk about subway conversions, they really need to think in terms of running longer LRT trains that stay in the subway. Converting from low floor to high floor cars would be a huge expense when all that is really needed is more capacity. Back in the days when an LRT to subway conversion might have meant replacing PCCs with their low platform / high floor configuration, an “LRT” subway didn’t make much sense. However, if our new fleet will have cars longer than our existing subway cars and with low floor loading, it is far simpler just to run longer trains. This would even allow retention of the LRT carhouses with vehicles moving to and from the carhouse in shorter trains than used in the subway. Would it be silly of me if I still saw a need and usage for an underground streetcar under Queen or another downtown street? Is there a way which we would be able to do it cut and cover in a no frills manor to keep costs down? What would the implications of such a plan be? Or would it be a non-starter because of b&%ching from drivers / store owners or because of utility relocation? 1. “Congestion” does not exist just in the core (say Yonge to University) or during the peak periods. 2. A subway will inevitably have more widely-spaced stops than a surface line. One of the congested areas on Queen is from University to west of Bathurst, and yet this is an area with lots of shops for which the existing stop spacing is beneficial. Yes, the westbound stop at Simcoe is superfluous, but not the others. As a subway, there would be far fewer stops. Some have suggested that Queen would make a nice pedestrian/streetcar mall. If we can close the street to cars for pedestrians, we can close it for transit too. We have to stop looking at high cost “solutions” to congestion problems on routes that will never have enough demand to warrant a full-blown subway. I personally think it was a wise move to focus on building rapid transit to the suburbs. For all it’s worth, the traffic on Queen isn’t really that horrible. The few times I ride the Queen car, I notice that the streetcars are usually held up by left turning drivers. I wonder if the service could be improved if left turns were controlled at intersections, or even banned all together during peak hours? Steve: I have not yet had a chance to examine the Queen route in detail, but it’s next on my list. Once I do, one thing that should jump out is the times and locations of chronic congestion, as opposed to random delays, on the route. Stay tuned. As for left turns, there are places where it is almost impossible to ban them given the street layout. The question is how to manage them when transit vehicles are around so that they don’t delay the streetcars. On a street only four lanes wide with a shared lane, the strategies need to be much different from those on Spadina or St. Clair, and they need to be tuned to each intersection’s behaviour. I agree that train length is more important to future expansion than vehicle type, but for simplicity, why not build the new line with high platforms and use high-floor trams from the start, as has been done in Edmonton, Calgary, Manchester, and Cologne? Both Bombardier and Siemens have modern high-floor vehicles for such systems, which would avoid the engineering compromises inherent in low-floor construction, and probably be safer as well, since people who would never dream of jumping down from a high platform will casually walk across from a low one (especially when there’s no third rail to scare them off). Steve: The problem is that the Eglinton line will spend about 2/3 of its length running at grade, not in a tunnel, and high-floor cars would require platforms at all stops. In Buffalo, and San Francisco, the LRT lines use both at grade stops, and high platforms. In San Fran, the Breda have steps which rise up when they reach the subway portion(The Muni Metro), and this allows high level boarding. Outside the tunnel, the step lower. In Buffalo, The LRVs have steps that extend from the body which allow people to board, and there are mini-platforms which allow people in wheelchairs to board. So it is possible for the TTC to permit high platforms in the subway portion of the Eglinton Line, and still have at grade boarding outside the tunnel. Steve: The configurations you describe are for high floor cars running on street or in tunnel. In Toronto, we will initially have low floor cars running through stations with low platforms. We cannot change the platform height as this affects all of the station structures including escalators and elevators. Observing today’s problems with 501 overcrowding and 10 min+ waits at the far ends of the route, a Queen Line would’ve been a great addition to the network. It’d definitely make an argument for saving the CHUM-City building and other landmarks and shopping districts en route. I’m just wondering why the proposals mentioned it only going as east as Jones? Was there heavy opposition to a subway entering the Beaches area? I could see stops farther east at Greenwood, Coxwell, Woodbine, Lee, Balsam, Neville Park and possibly to the very end, Fallingbrook. Or even having the line veer up Victoria Park creating new interchanges with GO and the BD line. Too bad suburban influence destroyed what could’ve been an ultimate urban convenience. Steve: The demand on the east end of Queen, even in the 50s, was nowhere near subway levels. The line branched at Kingston Road, and the service to Bingham on what are now the 502 and 503 was better at 1’20” than that on Queen at 1’30”. I know it’s hard to believe service was once that frequent, but it was. 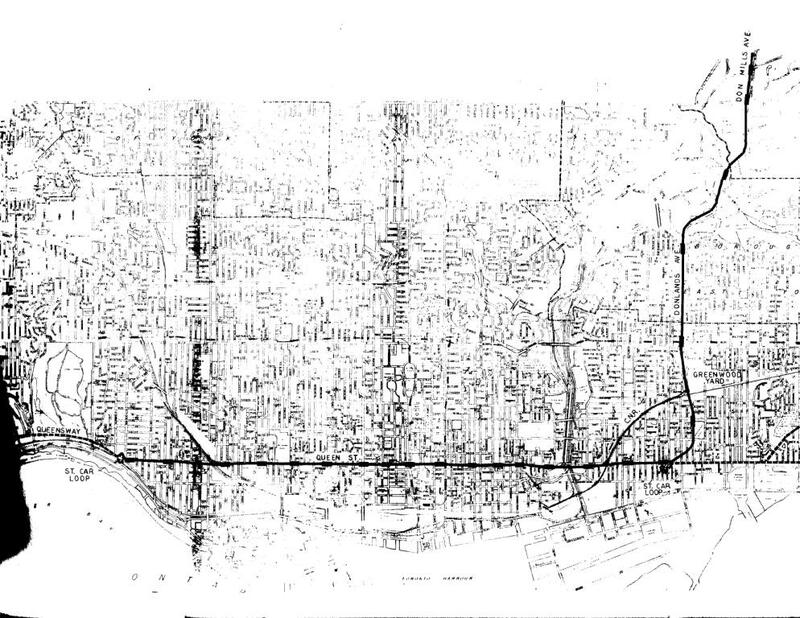 If any kind of rapid transit had gone east on Queen, it would have gone up Kingston Road. More to the point, though, when the Queen streetcar subway and its descendents were conceived, there was no Danforth subway, and a line swinging north to intercept the Danforth line made a lot of sense — what we now call the “Downtown Relief” line. Enough with this talk of a Queen Street subway! If a subway MUST be built let it be for the automobiles! Why should transit patrons have to be satisfied with the sight of tunnel walls while automobile drivers enjoy sights like Osgoode Hall and Nathan Phillips Square (to name but two) in the downtown area and experience the charm of Queen St. through the Beaches? Another point is that the logjam in the downtown area is no worse than the tieups at the Dufferin Jog and the Lansdowne Jamieson Jog. Shaw and Ossington used to be the same but Queen is wide there and track relocation was able to solve that problem. Aside from the damage subways do to the commerce on the street (which Steve explains very well) subways are about as enjoyable as an elevator. Patrons on the streetcar interact with the sights and sounds outside on the street. On a subway patrons are more likely to be listening to ipods etc., reading books or dozing off. There is no reason why streetcars can’t go fast and accomodate a lot of people. In Europe there are streetcars with up to nine articulations. They are low floor and are larely separated from the auto traffic. Subways are for people who simply want to get from point A to point B with little interference. Streetcars are for people who want ot enjoy the ride and experience their city while traveling at a decent speed from point A to point B. Buses are for people who are doing penance for their sins! I’m sorry but the streetcars are very slow, Long Branch to Neville Park usually takes anywhere from 1-1.5 hours if not longer. It’s nice to think in terms of nostalgia but in the real world if given the option to treverse the downtown core within 10 minutes or slug it along endlessly to sightsee every single antique store and every last art gallery on Queen West, I believe more people would choose the former. As is the street’s too narrow to accomodate a private right of way for streetcars as is the case in a lot of European systems and if it became a no-private-vehicles-allowed transit mall how would that perserve local street commerce? About the street culture being lost by a subway, don’t you think these sites would be more accessible if linked by a subway? I mean look at the BD line, apart from Yorkville almost the whole commercial strip is as under-developed as parts of deep Scarborough. No one can say with certainty that Chinatown or the Beaches or Parkdale or Riverdale would implode upon itself if this ever comes to fruition. Alternatively if more people are funneled onto Queen Street because of a new subway these communities would see more tourism and economy boosts than a surface route ever could allow. I made the case earlier of how a subway stop at John Street could possibly save the CHUM-City building because suddenly it’d be a central location on a line attracting 000s of more patrons to it as opposed to a gingerly walk away from Osgoode. Without a faster mode of transit similar fates could await all the shopping districts you fear will vanish. Also it’s interesting you mention jogs in the west end since if the subway reached Parkdale, commuter reliance on those intersections would already be handled leaving roadway issues to automobiles, not transit. Queen Street is just too important a throughfare to be held hostage by those afraid they’d lose more than what the city as a whole would gain. Bloor/Danforth has important shopping districts too (Bloor West Vlg, Koreatown, the Danforth) that subway commuters cannot see but they know they’re there and can visit at will. It’s never at a lost when one can get from Woodbine to Swansea within 20 mins proving the importance of a potential line under the very heart of the city. I found this post while trying to find out more about an interesting artefact. On the North side of Queen, where the road dives under the train tracks at Dufferin, there is a plaque commemorating the Queen st. subway station built there. It’s about 10 ft. above the sidewalk level, on the embankment east of the bridge. I saw it first while stuck in traffic, and it has nagged me ever since. If memory served, the Engineer was commemorated, and the date was turn of the century. Does anybody know if there is an actual station there, or was the plaque on the wall as far as they got? I know that there were multiple plans by the TTC up until 1970 for a Queen St. subway, but is there some older infrastructure in place already? Steve: The term “subway” means something that goes under something else, and a “subway” is simply another, more 19th-century term for what we call an “underpass”. This structure is correctly called the “Queen Street Subway”.